Prostormer 20V Cordless Angle Grinder is equiped with a high-capacity 4.0Ah Li-ion battery for longer life and more power. Soft rubber coated Handle brings anti-slip grip experience. Removable side auxiliary handle improves control and comfort for right and left-handed users. The metal protective guard deflects sparks and metal chips in using process, protecting you from getting hurt. 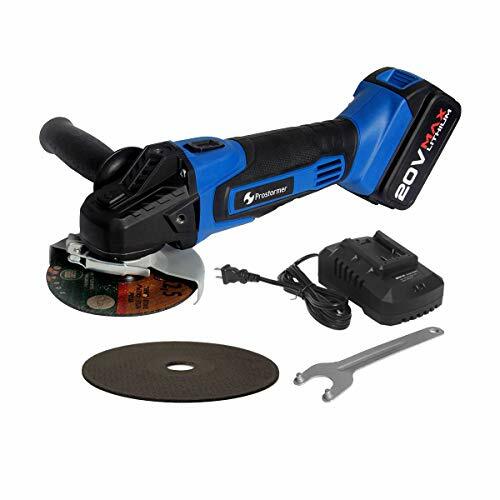 This cordless angle grinder is ideal for grinding, cutting and sanding a variety of materials including tile, concrete, pipe, wood, metal, and more. Note: If you have any problems in using our products, please feel free to contact us. We will try our best to solve your problem. [High-performance Motor] - Max 9000 RPM (no load speed motor) provides high power for cutting and grinding applications. [Adjustable Handle] - Auxiliary side handle works in three different positions (left, right and top), reduces vibration, offers more control and comfort. [20V Max Battery] - 4000mAh lithium-ion battery for a longer working time; Battery indicator provides you with real-time battery level all the time. 2-hour charging keeps full charged. [Wheel Diameter] - 4 1/2" Compatible with most replacement discs of the same size; Arbor Size: 7/8". Spindle lock for quick and easy wheel changes. [Durable But Lightweight] - Heavy duty Cast Aluminum gear head for added ruggedness and durability; Weight: 6.62Lbs (Battery included). If you have any questions about this product by Prostormer, contact us by completing and submitting the form below. If you are looking for a specif part number, please include it with your message.